The Denver Metro area is growing and is continually recognized for its attractive quality of life, labor force quality, and low cost of doing business which are key to attracting companies to establish a footprint in the Mile High City. Investors are increasingly attracted to Denver, as are established companies and startup firms. Denver job growth, population growth and new ‘big city’ challenges is a popular discussion among the commercial real estate community. However, despite our city’s new challenges discussed recently at the Future of Downtown Denver event, Denver was still ranked as the Best Place for Business and Careers by Forbes in 2016 and the 1st Best Metro Area for Economic Growth by Area Development. Denver’s geography and demographics have played a big part in its economic success. The location of Denver is a clear advantage for both domestic and intercontinental commerce. In addition to its geography, Colorado ranks among the top 20 states for best corporate tax system and business-friendly tax climate according to the 2016 State Business Tax Climate Index. The Highly educated workforce coming to Denver helps companies like ours grow our business and cultivate great talent. – Andre Durand, CEO of Ping Identity. Denver’s in-migration of highly educated workers from other states maintains a healthy pace, and the Denver area continues to attract the millennial generation, which not represents the largest population group in metro Denver. 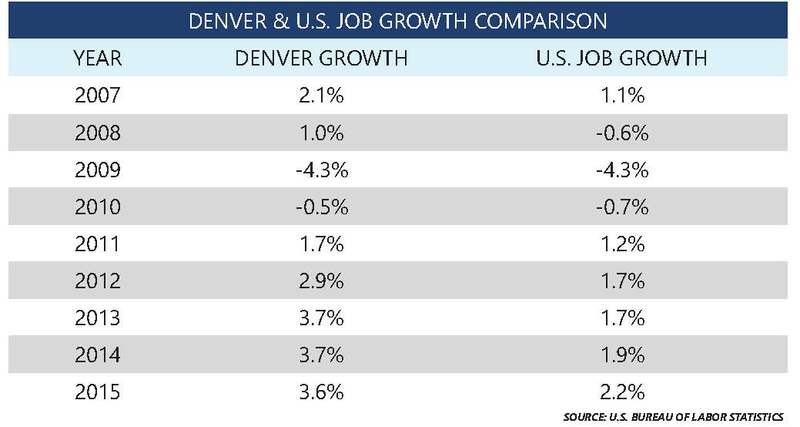 Whats the Denver Job Growth Update?